The Blue Mountains are a mountain range in New South Wales – they start 60 kilometers west of Sydney. 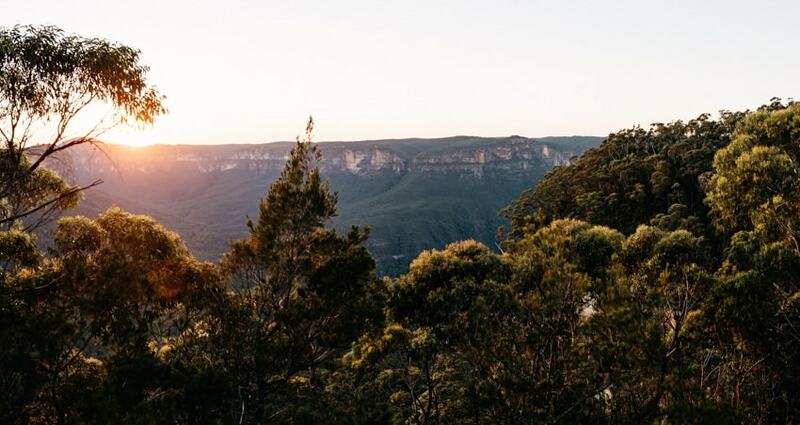 They are located in the Blue Mountains National Park and are a UNESCO World Heritage Site because of the biodiversity of the eucalyptus trees that cover the majority of the area. More than 90 different types of eucalyptus trees can be found there – which makes up 13 % of all known types of eucalyptus. Arriving from Sydney, we did not drive the entire way on the highway but on Bells of Line-Road. 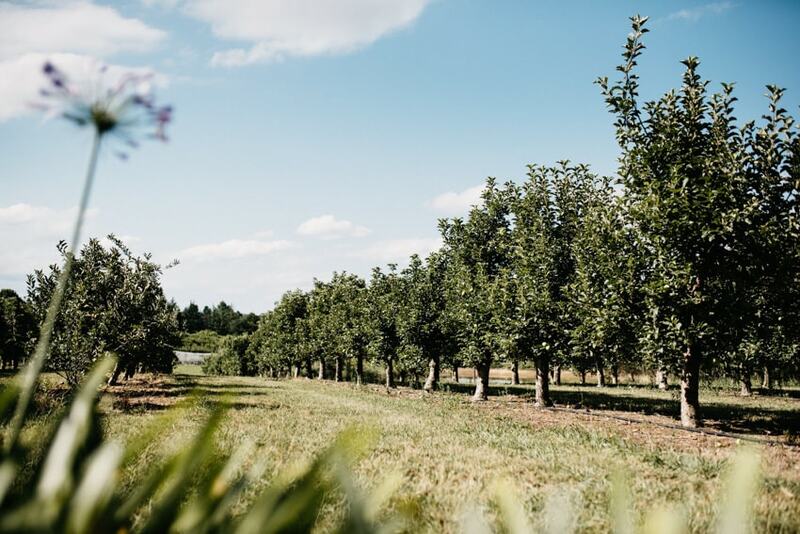 It is basically the Australian Apple Street – with many apple trees / plantages and lots of cider production. If you get there early enough, you can even try it– we arrived after 5 PM so everything was closed already. 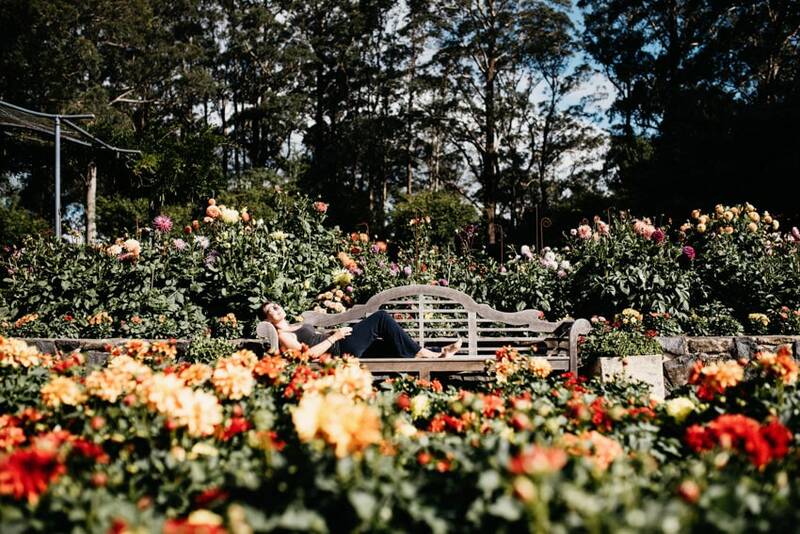 We visited the Blue Mountains Botanical Garden, which is pretty big and you could spend a day there – we just had little time and strolled through it for about an hour. Alternatively, you can take the direct route via the highway or better the “Western Motorway”. 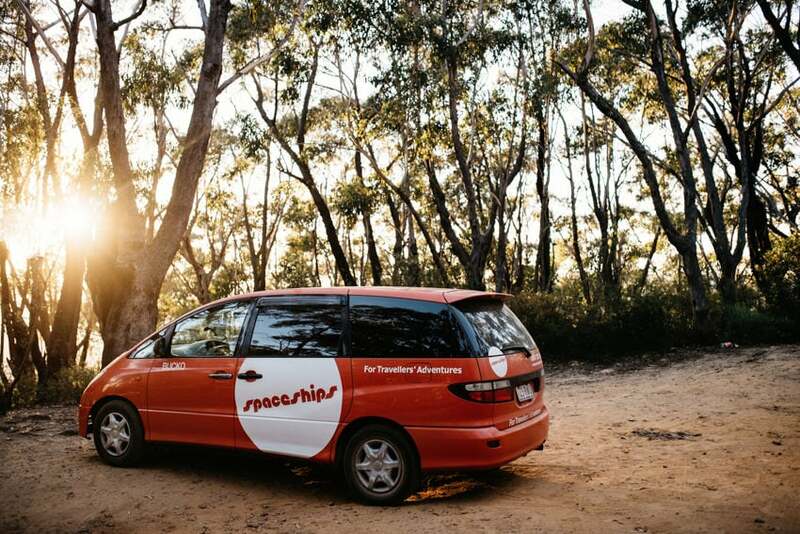 This is the faster way, however, you don’t get to enjoy the wonderful views and the Blue Mountains Botanical Garden. 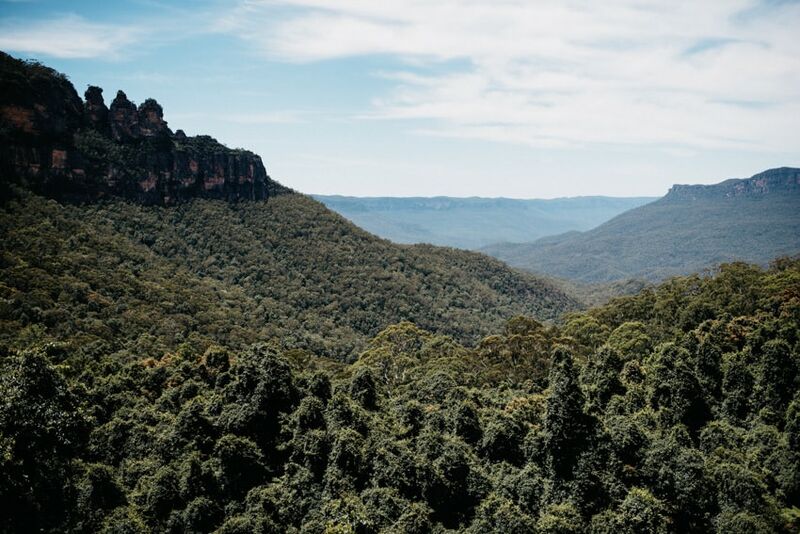 We decided to spend two days (3 nights) in the Blue Mountains National Park. If you love hiking, trekking and wonderful views, we recommend to spend two days in the park. You don’t really need more time as many of the trails lead through similar wooden landscapes. The Blue Mountains are located 1.5 hours drive from Sydney – towards the inland. It is basically a huge area of canyons that is almost completely overgrown with trees – e.g. eucalyptus. They are called Blue Mountains because under certain weather conditions, the eucalyptus trees appear blue. This happens because the eucalyptus oil evaporates and builds blue mist over the mountains. There are several towns that are part of the National Park, offering different viewpoints and serving as starting point for hikes. The major and touristic epicenter is the town Katoomba (accommodating Scenic World and Echo Point); Blackheath and Glenbrook being smaller and less touristy. 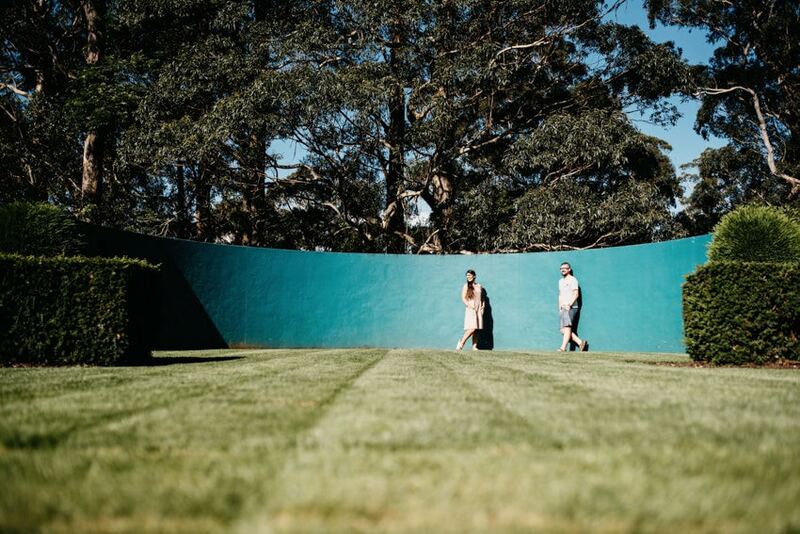 On our first day, we explored the area around Katoomba – it is the most touristic but, of course, not for no reason. It is home to the famous “Three Sisters” – a spectacular stone formation. 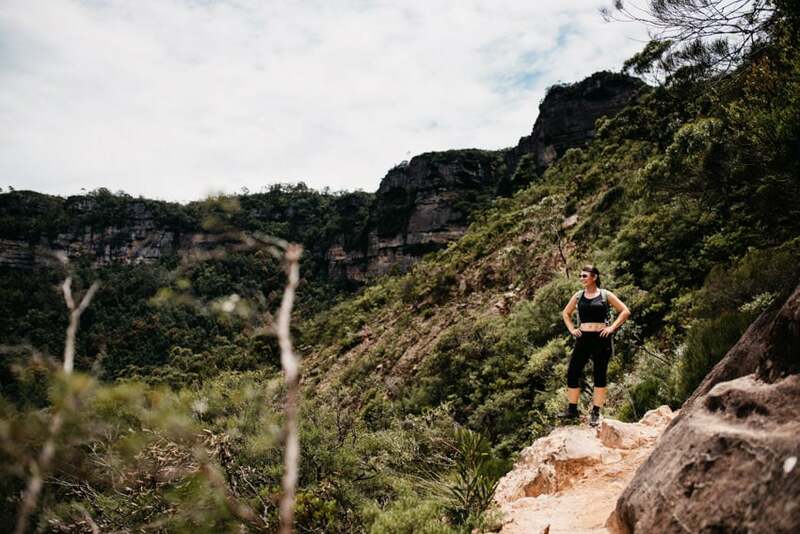 There are two major starting points for the hiking trails: Scenic World and Echo Point. There is a combination ticket for all attractions available (around 45 AUD per person) but you can also purchase them individually. From Jamison Valley, you can start different walking tracks, so if you are into hiking, the cableway/railway rides are just the beginning. Echo Point is not far from Scenic World. Parking is pretty expensive in the surroudings, make sure to park your car a little remote in a side street (check the signs carefully to make sure parking is a: allowed and b: free) and walk the rest. 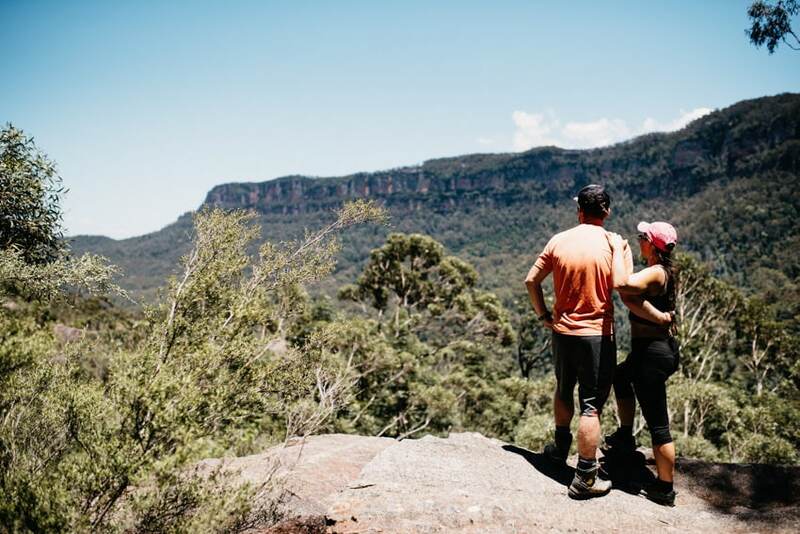 Echo Point features a viewing platform to the Three Sisters – the most iconic sight in the Blue Mountains. These are three rock formations overlooking Jamison Valley (the 3 sisters definitely have the best view down the Blue Mountains). As with many of the sights in Australia, there is also an Aboriginal legend to this landmark: three girls lived in the Jamison Valley and totally fell in love with boys from the neighboring town – a relationship that was legally prohibited. A bloody fight between the two tribes emerged when the boys decided to capture the girls to marry them. To beware them of getting harmed in the fight, a witchdoctor turned them into stones – unfortunately, he failed at reversing the magic. As a consequence, they are still stones, overlooking the Jamison Valley. 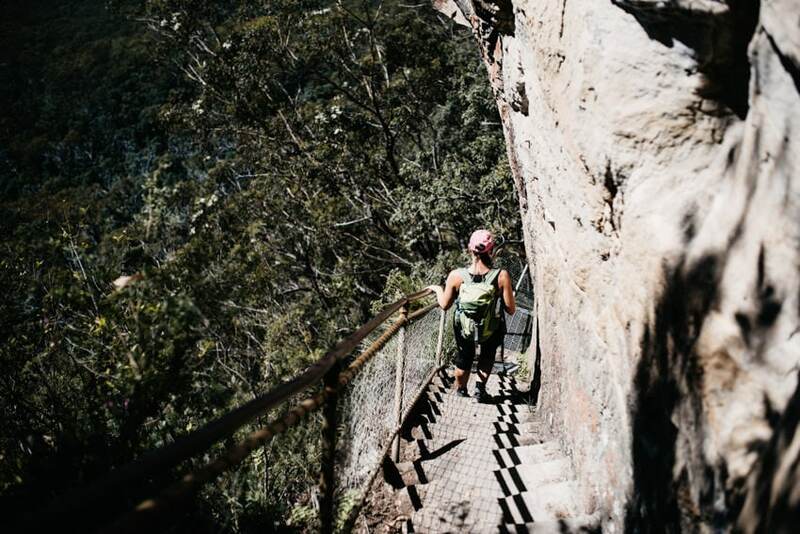 We started our walk through the Jamison Valley at Echo Point – more precisely, at the Giant Staircase. It leads down into the valley and the deep woods of the Blue Mountains via 900 steep steps. We climbed down the first steps and quickly reached the “Honeymoon Bridge”. It is a high bridge that enables you to cross over to the first of the Three Sisters – it does not necessarily offer the best view on them but, at least, over the valley. The staircase brought us down to the valley into the woods of the Blue Mountains. We walked through the forest until the station of the cableway (leaving from Scenic World) and continued towards Ruined Castle from there. The first part of the walk was pretty easy – more a stroll through the woods. We passed the historic coal mining site (which is very touristic as it is an easy walk and very close to where the cableway drops people off) and after we had turned right towards Ruined Castle, the track got a lot harder and pretty sophisticated. We climbed over rocks and after about 2 hours (including a little snack break), we reached the next junction. From there, you can either climb back up the mountain via the Golden Staircase or continue to Ruined Castle (another famous and iconic rock formation) and further on to Mount Solitaire. We were already pretty tired when we got to the junction, but if we hadn’t, we would have continued at least to Ruined Castle for sure. However, we walked up the steps to the carpark at the top, walked to Scenic World and continued to Echo Point from there via the Prince Henry Cliff Walk. This way takes a little longer (about 30-40 minutes – the direct way along the street only takes about 15 minutes) but it is totally worth it as the views on the canyon and the National Park are just stunning – especially in the early evening when the sunlight gets better. We ended our day at the Three Sisters-viewpoint at Echo Point. We do recommend to watch the sunset there as the sun goes down at exactly the right place to directly enlighten the Three Sisters giving them a wonderful yellow-orange-red appearance. Blackheath also is a major town of the Blue Mountains National Park. On our second day, we decided to choose between the “National Pass”-Trek and the “Grand Canyon”-Trek. As it was burning hot on that day, we decided to escape into the cool shade of the thick Australian forest and do the Grand Canyon walk. In order to start the Grand Canyon Trek, you get to choose from three starting points: The Grand Canyon Carpark, The Evan’s Lookout Parking Area and the Neates Glen Parking Area. 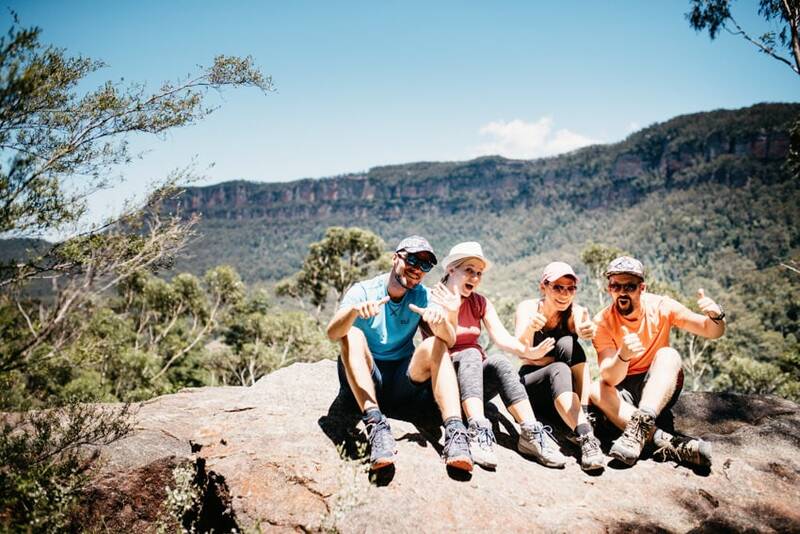 It is a little bit confusing and it took us a while to understand where to start the trek because it does not really start at the Grand Canyon Carpark – as we assumed first because of logically combining the name of the carpark with the name of the trek. As it turned out, the trek starts at Evan’s Lookout and ends at Neates Glen Parking Area or vice versa – as it is a loop parking at the Grand Canyon Carpark is the best option because you don’t have to walk too long from the car and back upon your return (Grand Canyon Carpark – Evan’s Lookout = approximately 750 meters and Neates Glen Parking Area – Grand Canyon Carpark = approximately 750 meters). Anyway, we started at Grand Canyon Carpark and walked to Evan’s Lookout to enter the trek. As with the majority of the treks in the Blue Moutains National Park, the first step towards the trek is many many steps down into the valley where the actual walk starts. The trek is 5.6 kilometers (… miles) and rather easy. It leads through deep rainforest, along canyons and waterfalls – it is very calm, you don’t get to see a lot of people, you only hear birds and meet the occasional lizard (from XS to XL we saw them in all sizes). We sometimes felt like in the movie “Liebling ich hab die Kinder geschrumpft” – very small surrounded by the huge forest. At the end of the little tour through the Australian woods, we had to climb the canyon back up to the car park – it was about 45 minutes of steep steps. 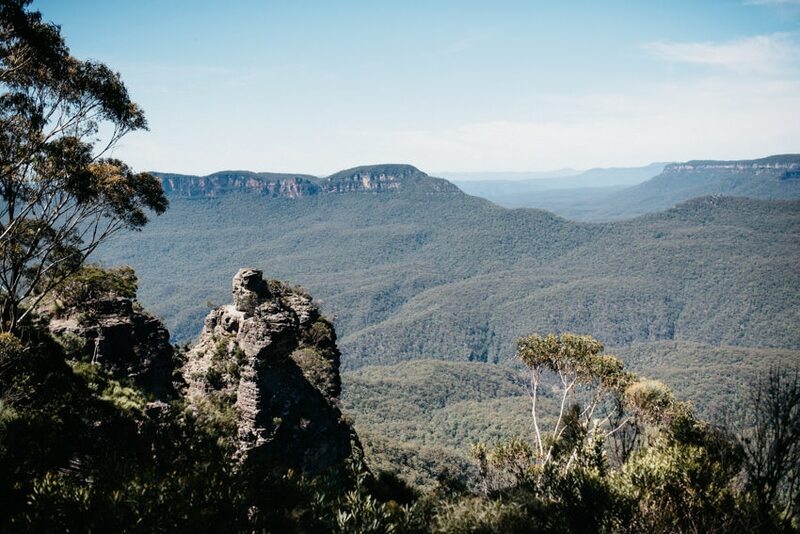 That is the worst part about hiking in the Blue Mountains – the hikes are more walks but getting to the trek and back is really exhausting. Bring your sunscreen – Australia’s sun is very strong (European sunscreens are not the best protection – you better buy the sunscreen of the Cancer Council which is especially made for Oz sun – you can get it in many different stores e.g. Woolworths, Coles, …). Even if you hike the Blue Mountains which is mainly covered by trees, there are parts where you will hike in the burning heat/sun, so you better be safe and put sunscreen on than sorry. Don’t leave the path – hiking in Australia is not more dangerous than anywhere else but there are lots of nice but also lots of not so nice animals living in Australia. Many people are afraid to go to Australia because of the deadly animals – yes, they live there too but it is not their goal to kill you as you are not part of their diet. So, they better save their venom for the real big prey. Snakes will only bite if they feel threatened, so just stay out of their comfort zone and you will be fine. You usually don’t see them – they do not spend their time on the paths – if you just stay on the paths and don’t go into the bushes. In case you see one, be calm, don’t panic and just give it enough space to vanish. We spent 3 nights in the Blue Mountains National Park. 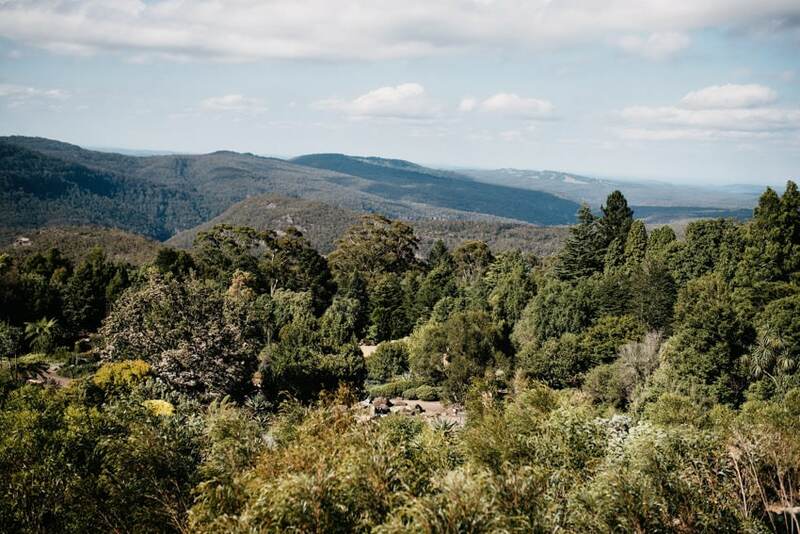 This campground is located in the Megalong Valley – about 10 minutes drive down into the valley from Blackheath. When we visited, it was high season (beginning of January) and when we arrived at 6:00 PM, we got the last campervan spot. Some people with cars and tents arrived later and still got spots but with a campervan or even an RV/camper, you should make sure to arrive on time during the summer months. The campground is well maintained and offers toilets (not the nicest but ok if you are in urgent need). 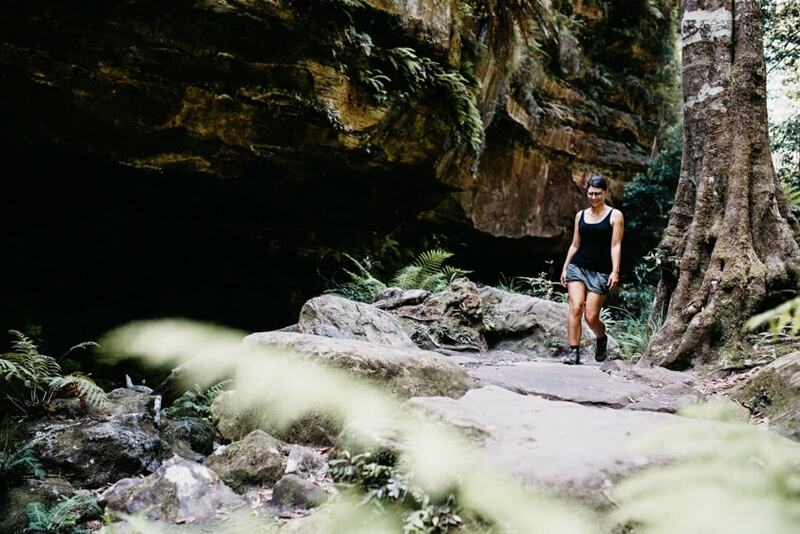 Just south of the campground, is the Six Foot Walking Track – from Katoomba to the Jenolan Caves – it is perfectly situated for a day walk, just doing part of the track. This campground is located – as the name already gives away – at Perry’s lookdown. It offers many spaces for campervans (it is a tent only campsite but there is not reason to not camp there with a campervan) – the first night, we arrived very late (around 10:30 PM) and there was still plenty of room for our van. The campground is accessible via a sealed road, however, the last 3 kilometers are unpaved (gravel). We liked this campground better, just because you don’t have to be there at 6:00 PM in order to get a space. The campground has a toilet and is situated at the start of the Perry’s Track leading into the Grose Valley and not far from the Blue Gum Forest. The smells and sounds of the Blue Mountains are wonderful. I can’t imagine what it must be like to camp there.